This Special Issue collects some state-of-the-art research into the design and development process. We believe that this is an important topic for investigation and that there are compelling pragmatic reasons to research the design and development process. After all, this is the process by which organisations create designs and bring them to market or deploy them! Better processes could potentially be a pathway to better products, services and systems, and ultimately higher profits. Numerous research publications have already established that the appropriate management of design and development processes, whether on the individual, team or organisational level, can help generate better designs and also help avoid potentially significant problems. For example, the proper integration of risk analysis in design and development processes can improve the quality of designed products, while a rigorous structure of well-considered design reviews can help prevent flaws propagating unnecessarily through the lifecycle of a project. As a result, in many domains companies are required by regulators to demonstrate understanding and control of their development processes. These examples indicate a few reasons why the design and development process (DDP) is important, but there are many challenges in describing and effectively navigating and coordinating such processes. Developing complex products and systems in particular can involve thousands of people over long periods of time. Decisions at the micro-level (relating to individual activities and their immediate contexts), meso-level (relating to flows of tasks as the design is progressed) and macro-level (relating to project/programme/contextual considerations) interact. Substantial coordination is needed to manage the complex dependency structures involved. For example, coordinating the processes of interaction between departments in a concurrent engineering project is important to ensure the right deliverables are produced at the right time, to avoid teams becoming starved of information or becoming overwhelmed with urgent tasks. It has been suggested that design and development processes are becoming more complex and more distributed. One reason is that design must increasingly transcend disciplinary and lifecycle boundaries, such that products, services and systems, manufacturing and maintenance processes (and many more issues) need to all be considered during design. There is a growing recognition that legacy systems are often to be used, that components and systems are often to be shared across product platforms, and the number of technologies to be considered continues to increase. To address this increasing complexity, there is arguably a need for greater understanding of the design and development process, as well as for pragmatic approaches, tools and methods to support design and its management. Seeking such understanding, design and development process characteristics, such as complexity (e.g. Braha and Bar-Yam 2007), iteration (e.g. Wynn and Eckert 2017), and the need for coordination (e.g. Levitt et al. 1999) have received much attention in the research literature, where insights are typically conveyed as theories and models. For instance, researchers have developed theories to explain aspects of the design and development process (some are collected in Chakrabarti and Blessing 2014), prescriptive process models to represent best practice (e.g. Pahl et al. 2007; Ulrich and Eppinger 2016), mathematical and computational models to deliver generally applicable insights (e.g. Yassine et al. 2003) and process-oriented support or improvement approaches (e.g. Eppinger et al. 1994; Karniel and Reich 2011). A recent review has shown that the many approaches selectively focus within a broad range of DDP issues and offer different perspectives on addressing them (Wynn and Clarkson 2018). While there are many well-developed theories and models, a theoretical understanding of the role of theory, models, and modelling in design and development practice is arguably emerging rather more slowly. A recent review article in this journal has suggested that state-of-the-art understanding of the design and development process is not embedded in any individual model, but in a set of models and also the relations between them (Wynn and Clarkson 2018). Here, relations means the similarities and differences among models. The similarities are of interest in that they help to delineate areas of work and understand the topology of the field, while the differences indicate diverse perspectives and opportunities for synthesis of new insights. However, there are many different ways of conceptually categorising the field and therefore many different ways of perceiving the similarities and differences across categories. In other words there are different themes by which a discussion of the Special Issue papers (and other papers in the area) could be organised. One possible theme could be to emphasise the similarities and differences between various domains that are foci for design and development process research—for instance, the design and development process in construction vs. that in mechanical design. On the one hand, processes in different design domains can seem quite different, but on the other hand the underlying structure of the design process has been established to be similar when viewed at a certain level of abstraction (e.g. analysis, synthesis, and evaluation; or abduction, deduction, and induction, etc.). The papers in this Special Issue are representative of design and development process research in different application domains, including facility design processes (Gralla et al. 2019; Piccolo et al. 2019) as well as mainly mechanical design processes (including Menold et al. 2019; Zhang and Thomson 2019; Tahera et al. 2019). A second possible theme could be to emphasise that design and development process characteristics depend in part on the degree of constraint and complexity of engineering physics that must be dealt with. Towards one end of this spectrum, researchers consider the processes that occur in design situations that are relatively lightly constrained, often with an emphasis on problem framing and creative generation of novel designs, while towards the other end, they investigate the processes of developing complex, evolutionary designs where there is a great emphasis on engineering analysis and a need to consider many issues such as cost, weight, efficiency, safety, etc. Again, several points along this spectrum are foci for this Special Issue. For example, the papers by Martinec et al. (2019), Gralla et al. (2019), Li et al. (2019) and Menold et al. (2019) focus on relatively unconstrained scenarios while the papers by Zhang and Thomson (2019), De Lessio et al. (2019) and Tahera et al. (2019) focus on relatively constrained incremental design contexts. A third possible theme could be to emphasise the different research methods used to develop insight into the DDP. The use of different approaches reflects (and is reflected in) the types of insights gained, but also may facilitate triangulation of findings. The papers included in this Special Issue use a range of research approaches, including study of design teams in representative situations (Martinec et al. 2019; Gralla et al. 2019), study of projects in a university context (Menold et al. 2019; Li et al. 2019), computer simulation of design and development processes (Zhang and Thomson 2019), industry workforce surveys (De Lessio et al. 2019), industry interviews and document analysis (Tahera et al. 2019) and retrospective analysis of project data (Piccolo et al. 2019). Another theme, and the one chosen here, is to observe how many research publications focus on DDP issues viewed on either the micro-, meso- or macro-levels of scope. These levels are defined by Wynn and Clarkson (2018) as, respectively, focusing on individual process steps in their immediate contexts, on end-to-end flows of tasks, and on project structures or the design process in context. Once again, all these categories are covered by one or more of the Special Issue papers. The above themes illustrate the diversity of research in this area—other themes are possible as well. The common element, and scope of this Special Issue, is that all the papers investigate facets of how new designs, products and systems are (or should be) generated, placing a particular focus on how the work unfolds (or should unfold) over time. The eight articles in this special issue examine the design and development process from different perspectives, using different research methods, to address some of the issues discussed above. They represent recent advances across the micro-, meso- and macro-levels of scope as defined above. The first three of the articles focus mainly on micro-level design activity. Firstly, Martinec et al. (2019) focus on the analysis, synthesis and evaluation operations that occur during design. Based on literature review, these authors synthesise a new process model representing micro-level team design activity as iterative transitions among these operations, considering both the problem and solution spaces. They code video recordings of team conceptual design activities using this model, developing insights into the frequencies of the operations and the sequences of transitions among them. Differences between ideation and concept review activities are explored in depth. Although considered part of this special issue, this article appears physically in the previous issue. Secondly, also focusing mainly on the micro-level, Gralla et al. (2019) investigate how teams of designers approach the decomposition of design problems and the similarities among different teams decomposing the same problem. Five teams of experienced professionals were observed working on the same facility design problem for a 3-h session. It was found that that teams followed a partial top-down decomposition process with a general progression from a top-down towards bottom-up approach. Other findings were that design problem structure influenced, but did not fully determine the decomposition, and that different groups approach the decomposition in different ways achieving different results. Thirdly, Menold et al. (2019) investigate whether using a framework that provides guidance on the use of different prototyping activities for different purposes during the design process may impact on various attributes of the produced design. Design attributes in focus include perceived design quality, manufacturability, and user satisfaction. They approach this question through study of 77 student team projects in junior-level mechanical engineering design—some of the teams received training in the framework and others did not. Among other conclusions, Menold et al. find that introducing their prototyping framework in these projects did lead to improvements in overall perceived design quality, with differences perhaps due to how the framework was implemented in each case. The next three of the articles consider design and development processes mainly at the meso-level, all approaching this by combining computer modelling with analysis of industry case studies. Firstly, Zhang and Thomson (2019) discuss a knowledge perspective on the development process of complex products. They develop an agent-based model that represents how designer knowledge is gained and applied in the realisation of interdependent product functions, and use the model to predict project performance in terms of effort and time required for completion. The model relates knowledge to issues including work quality, efficiency, and consultations required to resolve emerging design issues. It is applied to a case study of hydroelectric generator design to develop insights for management. Secondly and also on the meso-level, De Lessio et al. (2019) note that design project coordination involves many stakeholders interacting with a multitude of plans at different levels. These authors argue that the interactions among planning processes, plan documents, issues being planned and stakeholders in planning can be analysed as a system—the planning system. De Lessio et al. develop a survey to elicit the design planning system from a company, which is used to populate a dependency matrix model and investigate opportunities for improvement. Their research draws on a case study in a large company that develops complex scientific instruments. Thirdly on the meso-level, Piccolo et al. (2019) take a socio-technical perspective on iteration in the design and development process. They argue that, while many researchers consider design iteration from either a technical perspective (e.g. dependencies among tasks) or a social perspective (e.g. interactions among people), an approach considering both these domains together can yield additional insight. Analysing a dataset regarding the evolution of documents during the development process of a biomass power plant, they investigate the patterns of iteration in different design phases and use regression analysis to test hypotheses about the relationship between iterations and network characteristics of the interactions among documents, activities, and people. Among other insights, the paper casts light on how iterativeness tends to increase in the presence of integrative activities, activities involving external suppliers, and large numbers of stakeholders. The final two Special Issue articles consider design and development mainly at the macro-level, developing process models to address two different issues in engineering design and development projects. Li et al. (2019) focus the development of new products that incorporate data-driven features alongside engineered hardware. Noting that many engineering companies may not have the capacity for data product development in-house, they draw on literature to propose a process model that integrates the canonical engineering concept design steps with the concept design steps recommended for a data product, identifying key information flows that must take place between these disciplines to develop a data-driven product. The model is applied to development of a smart unmanned aerial system in a university context, leading to a detailed model of the various information flows required and their characteristics over time. Li et al., suggest that this model could help structure the development of products with data-driven features more generally. Finally and also on the macro-level, Tahera et al. (2019) focus on testing in the incremental design and development of complex products. 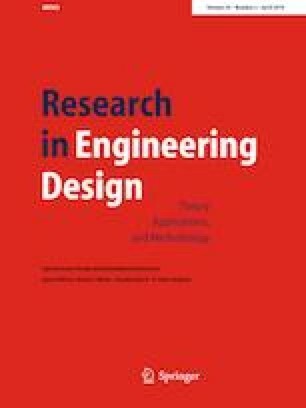 A review of engineering testing in literature reveals that most existing macro-level process models do not represent the relationship between testing and engineering design. The review also reveals few descriptive empirical studies have been published on testing in incremental engineering design. Addressing this gap, Tahera et al. report on interviews and document analysis in three companies in the automotive sector. The processes of these companies are discussed and a generalised descriptive process model is developed that emphasises the importance of testing in engineering product development. Acknowledgements are due to all contributors who submitted their work for consideration in the Special Issue, as well as the members of the research community who gave time to review submissions. Overall, more than 35 manuscripts were submitted leading to the eight papers comprising the Special Issue (including Martinec et al. 2019, which appears in the previous physical issue). Where the Guest Editors contributed as coauthors of papers (two in this Special Issue), the review process was handled by the Editor-In-Chief. We also thank the Editor-in-Chief, Professor Yoram Reich, for his feedback on this editorial.